You recently purchased WinSQL Standard, applied the serial number and restarted WinSQL. However, it is still running in Trial Mode. This is normal. For the first 30 days WinSQL always runs as if you are using WinSQL Professional. 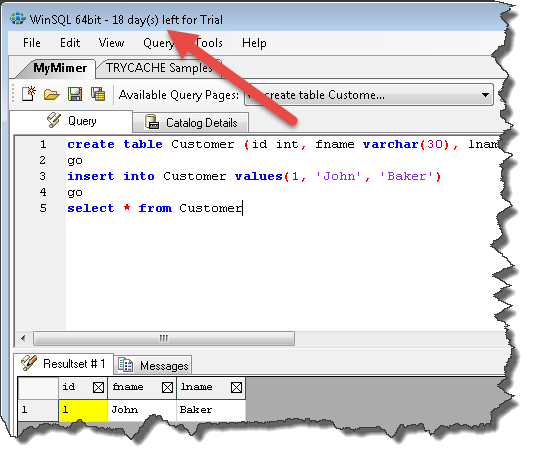 If you purchase WinSQL Professional before your trial period is over, it automatically ends the trial period. However, this trial period does not end when you purchase WinSQL Standard. After you register WinSQL Standard and restart the application, your screen looks like the image you see on the left. Notice that you see a comment (appearing in green) that confirms your registration is complete but WinSQL will run in trial mode for the first 30 days. This comment also display the number of days left for your trial period. This is done by design to give you a full 30 days of trial period. If for any reason you want to run WinSQL in Standard edition, you can use a command line argument to force it to run in Standard mode.